The professors of the Visualizing Cultures course are planning to republish their OpenCourseWare site on Friday with additional context to amend a previously controversial section. The Web site was taken down last week after it generated much debate surrounding the section, titled “Throwing Off Asia,” which includes historical images depicting the execution of Chinese prisoners by Japanese soldiers. The additional context would be presented in very clear disclaimers located on or near the images. Also in the works is a location on the Web site promoting public dialogue and discussion of the images, MIT home page coordinator Suzana Lisanti said. Professors Shigeru Miyagawa and John W. Dower, co-creators of the course (21F.027J), made these decisions after a week of discussion with members of the MIT Chinese community, most notably during a well-attended public forum held last Wednesday night and a meeting with officers of the MIT Chinese Student and Scholar Association Thursday morning. Representatives from the president’s office and the MIT News Office also attended the Thursday meeting. The CSSA’s main concern, as listed in a statement issued early last week, is that “the proper historical context for the prints” be included and that the text addresses “the racist sentiment and provide the historical perspective” of the woodprints, which are propagandistic in nature. According to Miyagawa, one of the main issues discussed on Thursday was what changes to make to the Web site to prevent similar misunderstandings in the future. The discussion resulted in a constructive agreement, said CSSA President Huan Zhang G.
The faculty “recognized the need to contextualize these sensitive materials and pledged to continue a dialogue with CSSA and other groups to address this issue,” Zhang and CSSA Vice President Lin Han G wrote in their statement last Thursday. The professors and the course’s webmasters plan to meet again later this week with the CSSA officers to have them review the amended material before it goes back online. “I’m glad so many groups are working together to make [the situation] right for the healing process to continue,” Miyagawa said. 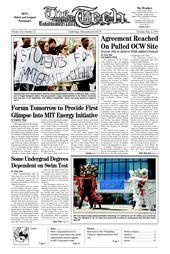 The controversy began when the OCW site was spotlighted on http://web.mit.edu/ on April 23. Miyagawa, Dower, and the webmasters for the site began receiving complaints and concerned e-mails almost immediately thereafter. While some of the e-mails were constructive, others were racist and violent, and it quickly became clear that the images in question had been spread around the Internet out of context. Zhang emphasized that the CSSA is opposed to personal attacks and threats. According to Scott Shunk, the project director for Visualizing Cultures, the violent e-mails subsided dramatically on Thursday once the three statements from the CSSA, MIT, and the professors were released online. Miyagawa said that the recent e-mails he has received are supportive, and some are apologetic. Since reports of the controversy had made it to China, Chinese language professor Jing Wang and CSSA students offered to translate the three statements (http://web.mit.edu/newsoffice/2006/visualizing-cultures.html) into Chinese. Another major misunderstanding, Shunk said, was about the purpose of the OCW site — some thought it was an art exhibit. Shunk stressed that the course is a scholarly research project looking at visual historical narrative. An interesting question raised by the controversy, Shunk said, is how to present complex subject material to the general public. According to Lisanti, the Committee on Campus Race Relations is considering hosting a panel discussion on the power of visual images early this month.